Mary K. Nickel, age 104, of Covington passed away on Saturday, July 7, 2018 at Brookdale of Piqua. She was born on November 5, 1913 in New Carlisle to the late John Franklin and Calla Etta (Cost) Weaver. Mary is survived by her son and daughter-in-law: Charles E. and Kay Nickel of Covington; half-brother: Dale Weaver of New Carlisle; half-sisters: Nancy Weaver and Lou Ann Weaver both of New Carlisle; nine grandchildren: Lisa and Craig Niemann of Virginia, Veronica and Kevin French of Piqua, Kevin Nickel of Russells Point, Jason Nickel of Piqua, Mary and Kraig Peters of Bradford, Peggy and Luke Basham of Ansonia, Linda Mead of Pleasant Hill; Rhonda Burgess of Sidney and Karen and Mike Longstreth of Dayton; twelve great grandchildren; nineteen great great grandchildren and many nieces, nephews and friends. Mary was preceded in death by her parents; husband: Henry M. Nickel; daughters: Virginia Green and Kay Mead; son: Kenneth Nickel; brothers: John “Pete” Weaver and Howard “Jim” Weaver; sisters: Irene Davey and Una Godfrey and eight half siblings. Mary was a 1933 graduate of New Carlisle High School. 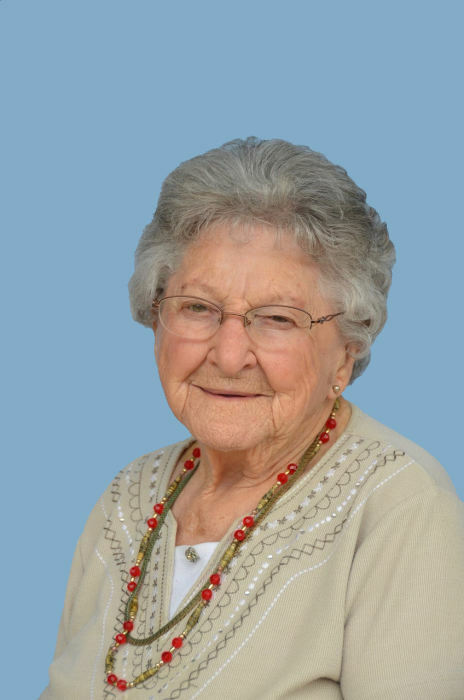 She was a longtime member of Covington Christian Church; Covington-Newberry Township Historical Society; Alpha Garden Club; Brukner Herb Club and the former Pierian book club. She was retired from Century Electric, Gettysburg. Services will be held 10:30AM on Wednesday, July 11, 2018 at Covington Christian Church with Pastor Nick Church officiating. Interment will follow in Miami Memorial Park, Covington. Visitation will be 4:00-8:00PM on Tuesday at Bridges-Stocker-Fraley Funeral Home, Covington. Memorial contributions may be made to Covington-Newberry Township Historical Society, Covington Outreach or Covington Christian Church.